Place all ingredients on an ungreased baking pan. Combine well using your hands. Bake about 30 - 35 minutes, stirring at 20 minutes, then check every 5 minutes. Bake until well browned - watch carefully. Remove from oven, stir and cool in pan. Don't under-bake. 61 Comments on "Easiest Granola Ever. Seriously." Hi from Connecticut, Jenny! I am baking this for the third time today. My husband loves it. I never seem to have the coconut on hand, so omit it. I do add a tsp. or so of vanilla extract. Wonderful! 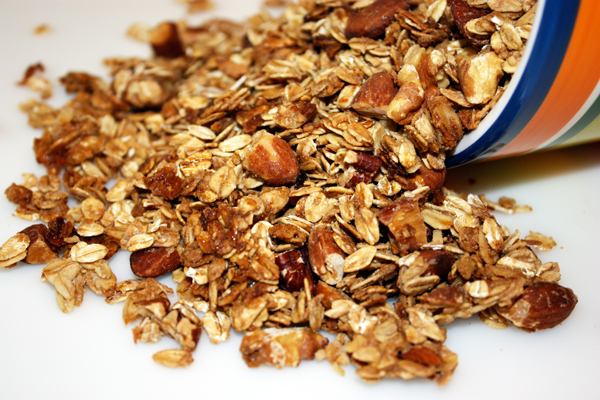 Love this Granola recipe. I’ve been eating it as a cereal, snack and I mix it in my yogurt. Love love it. Thankyou. Thank you for your recipes! I have tried several and I have never been disappointed. I make granola similar but I use six table spoons of coconut oil and about a third cup of muscadine jam instead of syrup. I don’t add anything else until I serve it. Delicious and easy. What else could you ask for? I did add some raisins. I put it on some coconut yogurt for breakfast this morning. Perfect! You are really good at cooking; and teaching.. 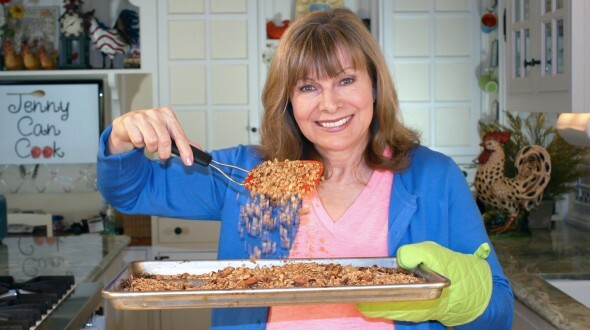 I actually enjoy watching and learning from you and it motivates me to try the recipes, mostly because I like the foods you are demonstrating (fairly nutritious), but also because the recipes seem doable. Thank you for helping us. I just stumbled on to your website and wonderful collection of recipes, especially the Polish food recipes. These are foods that my grandmother used to make us ( of course all from scratch) . I always make my own homemade soups, and just started baking my own breads..I was a scary cat about yeast! Your recipes are going to the top of my “where to look for a great meal” search. Thank you for sharing your recipes and great attitude! I wish we could still see you on TV. This has been wonderful for our family. I would like to try your granola recipe, but hate maple syrup and oil in my bakings of any kind. Can I substitute butter for the oil, and maybe honey for the maple syrup? I don’t know how that would work. It might be better to look for a different recipe. If you don’t like oil, you can omit it. I make granola without oil. You can substitute the maple syrup for honey. Thank you so much Jenny for the granola recipe. I made it and it is DELISH!!! I enjoy watching you cook and being in your fun kitchen. You make cooking pleasant and easy. I’ll be making more of this for Christmas for gifts. This recipe is terrific. I’ve made it several times. What kind of baking sheet is this exactly? I think I need to invest in one. There is no writing on it. I think I got it at Target, or maybe Bed, Bath & Beyond. HI, I think a nicely made sheet pan is available on amazon for 20 bucks. It’s a thickish polished aluminum one that doesn’t distort in high heat in your oven and they are soooo helpful for doing so much in your kitchen. You can roast chicken or just about anything that you can think of on these pans. I even bake on them at high temps using a silicone mat. Indispensable tool. I am making my second batch now. My sister was making it for me and I felt guilty so now I am making my own. So easy and yummy. I share it with everyone at work. I just love your videos! I use to watch your show and love it too. Glad to see you are still making peoples life’s healthier you always gave good advice. Thank you Jenny. I do not think we have it here n Brisbane Australia although I could be wrong. Anyway while I am writing this the granola is in the oven and every time I take it out to stir I have a little bit to taste and oh my gosh it is heaven. Thank you so much for the recipe. I mix the ingredients with a wooden spoon in a big bowl, then spread on cookie sheet. that way I don’t lose any of the ‘good stuff’ to hands or gloves, and I use a rubber scraper to get every bit of goodness out of the bowl. that’s just me. 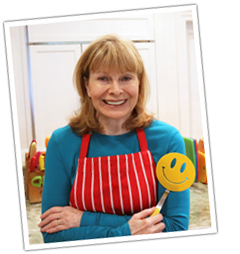 Your website is my first ‘go to’ for simply delicious and easy recipes. your videos are fun too. I so want to try this, but as I live on the islands with lots and lots of fresh coconuts, can I use fresh grated coconuts for this recipe? I have only made it with store-bought sweetened coconut so you may just have to try. use fresh grated coconut! It works very well. Jenny, this is a very taste recipe! Fauzia, thank you for helping out. This is delicious granola cereal! I’M NOW ON MY THIRD BATCH! Hey Jenny, thanks for the website! The recipes look amazing – perfected over years I bet. Am in Germany and so excited about the tortilla recipe! The tortillas they sell here are made in Sweden… All I’ll say is that they don’t taste like much. Concerning the granola: I am not a fan of coconut, but I can imagine it brings an important flavor to the granola. Could you possibly suggest an alternative? Also, if I want to add a bit of cinnamon, do you think I could do this before cooking it? Granola really doesn’t need the ‘glue’ function of coconut to hold ‘the bars’ together but I like the added flavor . This recipe is very tasty and very good. My husband and I had it mixed in our Creek Yogurt. I love this recipe, and I also love changing it up for time to time. I made it today using coconut sugar in lieu of brown sugar. It’s a little healthier with zinc and iron and some antioxidants (according to the infallible Internet) and tasted really good. Granola, packed with nuts, and loaded into plain low fat Greek yogurt with tons of fruit, makes up the biggest part of my daily food intake. Could be worse. Great granola recipe Jenny! I add 1/2 teaspoon of organic turmeric powder to the mix for anti inflammatory action! Jenny i cant Just use the oats and maple syrup? Instead of Brown sugar i can idea normal white sugar? this is the best granola ever, thanks! Do you have a recipe how to make muffing with these granola? I don’t have a granola muffin recipe. There is an older granola video that I made (still on youtube) but the recipe is the same. Only the technique in the new video is simpler. It’s not my sister’s recipe but she is the one who told me you can make granola at home. Hi Jenny, just want to say THANK YOU SO MUCH!!!! I made your granola and today I’m selling it, and I’m earning money. I am from México city and I hope you understand my english. I haven’t practiced for so many years. It’s delicious. I already have my bags and my brand printed on them. Again, THANK YOU VERY MUCH!!!! jenny- I was a fan of your show and wondered where you went. wow-beauty, brains and jenny-can-cook ?……wow again. thank you for your delicious recipe. Hi Jenny: how I can do a bigger batch? your recipe is just enough for 1 day in my family of 3….also what can I use because the cookie sheet is not going to hold the bigger batch? I wish I had a solution but it needs to bake on a sheet. If you have a second cookie sheet you could probably set your oven rack for two sheets (usually one rack down from the top and one rack up from the bottom) and you could bake two racks at the same time. It’s good to switch & rotate the pans about half way through. can i use honey in place of the maple syrup? its hard to get real maple syrup where i live and even if u get it its super expensive. Based on the comments below, it looks like you can use honey instead of maple syrup. I loved this. It’s my quick snack or breakfast on the go. I tried it with coconut oil, yum…. I had to use honey & canola oil but my batch still came out great . Oh my gosh – I will so be using this recipe for years to come ! And yes , I can also see adding favorite ingredients if you like . I love this recipe as is , though . Made this on Saturday – delicious and easy. I think I doubled if not tripled the sugar, syrup, and oil, and added honey as well. It gave good flavor and in the dry ingredients I threw in some cinnamon sugar mix as well. I love these recipes because they are so fun to play with. Thank you Jenny! I just made your granola. I didn’t have all the ingredient that you had. I used raw agave nectar. This is the best granola I have eaten. Thank you for the recipe.. I love watching you cook and the recipes. Gonna make this and take some with me whenever I go hiking,in case I get lost and hungry lol thanks! I really like this recipe. I use honey instead of maple syrup and coconut oil instead of canola. Thanks for sharing it. I have lost 175 lbs. and one of the goodies that I use all the time was your granola. Simple, tasty, and affordable! Thanks !! You’re are right sooooooo good! Thanks from Oregon!